The VCF is a Salen&Key filter as implemented in Synths'r'us site by René Schmitz. I have modified this schematics to add CV control for VCF Cutoff and resonance. 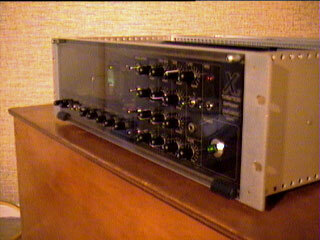 Builded with 6AU6 and 6U8 tubes plus a 220V/24V transformer for feedback. LDR cells are coming from an old measurement tool and are fast and accurate. All optical parts of the filter are enclosed in a metal box to avoid ligth and electronic interferences. It is possible to use the VCF/VCA module independently with noise module only or an external audio jack. A little line preamp +20db ( aop) is integrated to the modulation pcb. 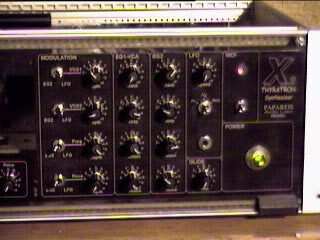 The Magic Eye is an EM81 wired as a basic peak meter, plugged on VCA output. Another pin compatible Magic Eye with different look is the EM84. The Modulation pcb contain a pair of ADSR ( asm1),homemade LFO (tri,sqr,rnd) + CV adders/scalers, glide, noise. 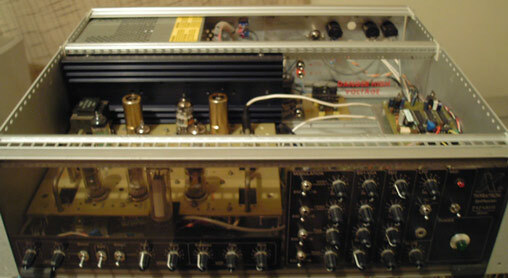 The PSU is builded with a PC386 PSU (on top) modified to deliver 6V@5A for tube filaments and 14V@1A for the MIDI3CV.There is a couple of 2x15V @1.5A transformers mounted under the PC psu to produce the +/- 150V for tubes modules and a classic 7815/7915 psu for modulation pcb. There are switches for both VCO on rear panel to disconnect unused modules if i plan to play with one VCO or with the filter/vca module only. 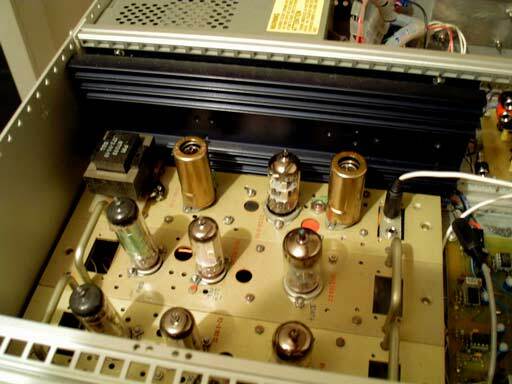 The little trouble i have with the power supply is that when tubes are cold, i need to remove 1 tube to start the synth , else the PC386 unit fall down until i remove it ... It is another reason why i have implemented modules On/Off switches...There is no problem when tubes are hot. Pictures of the X2TS internal assembly ,modules and pcb. The front panel is a couple of aluminium panels, placed behind the plexyglass. The front has been printed on an adhesive sheet for laser printers.This film has been glued on metal parts who are fixed by pots and switches.Knobs are Rean's for 3.18 mm potentiometers (Sfernice and Spectrol cermets). The green power switch is recycled from an old dead measurement tool ...I really love recycling this kind of good parts ! MIDI interface drive VCOs and the VCF cutoff . It is a MIDI3CV interface, the ancestor of my "MCV series" with a special firmware of 2 table of 28notes to tune each VCO independently. The interface is controled by the same PC config software i use for basic versions of the MIDI3CV. 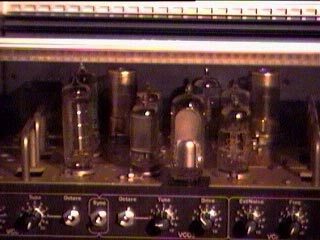 All this work rather well, but the MIDI3CV is an 8 bits interface and a bit short in precision to reach perfect tuning with unmatched Thyratrons tubes. 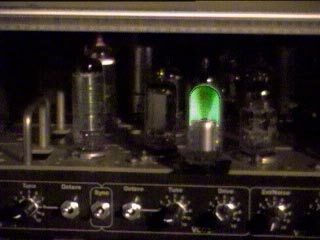 Both VCO delivers a lot of signal and good tuning is obtained only when they are hot and only for a defined position of tune knobs, else the interface must be retuned. The best way to avoid VCO beating on every notes is finaly the Sync switch ! 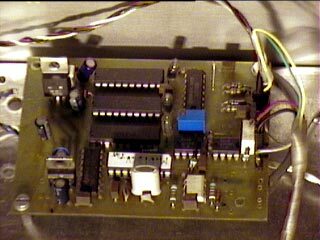 I have in mind to build another MIDI interface with a larger PIC and a 12bit DAC or a multiplexed one, to reach a more precise control. At this time, the 8 bit interface is good enough and allow to a scale of 2octaves (quite) well tuned.